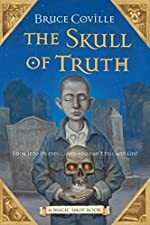 The Skull of Truth by Bruce Coville. A Magic Shop Book. Review: Are you looking for the creepiest, yet most interesting book in town? If you are interested in reading a book that will take you on an adventure, you will love The Skull of Truth by Coville. In The Skull of Truth, Charlie has taken something that he will never forget. This is one of several books in the series. In The Skull of Truth, Charlie is forced to take the skull of the truth. Now that he has stolen it, he has to keep it until Mr. Elives, the shopkeeper, returns to give it back. Everyone knows that Charlie lies a lot, but now that the skull is here, things have changed. Now that he possesses the skull, he must always tell the truth. In the process Charlie loses some friends, but in the end he regains them and even makes more! I've said too much; if you want more, you'll just have to read the book. The Skull of Truth is really fun, and it is an adventurous book to read. It is exciting and mysterious at the same time. The book kept me on my toes too. Whenever I had free time, I wanted to read that book. I was anxiously waiting to find out what would next. The author ends the chapters very nicely just in the right place. For example, at the end of the book, when Charlie has to return the skull to Mr. Elives, the chapter ends right before he decides what he is going to do. I recommend this book to third-sixth graders. This is because the concept might be too hard to grasp for a younger age group, and might be too easy for an older age group. This book is wonderful, adventurous, and eerie in all the best ways! We would like to thank Houghton Mifflin Harcourt for providing a copy of The Skull of Truth for this review. Have you read The Skull of Truth? How would you rate it?